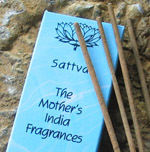 The Mother' India Fragrances is a hand rolled incense made from pure and natural ingredients. Based on traditional Indian fragrances, The Mother's India Fragrances contain honey and mattipal. This gives the fragrances their full, sweet scent and makes them soft to the touch. Standard incense sticks: 20 Sticks per pack - Burns for over 1 hour per stick. Incense Mini-Sticks: 12 Mini=Sticks per pack. Burns 20-30 minutes per stick.